Most internet resources are accessed through a web interface, which means they’re normally very easy to use. You might have menus, text prompts, graphics, maybe wizards to walk you through whatever you’re trying to achieve. For more low-level control, though -- micro-managing your own web space, maybe setting up a remote server -- you might still need a terminal emulator like the free-for-personal-use Xshell 5. You may never use most of these, of course, but don’t be put off. Xshell is extremely powerful, but it’s also surprisingly straightforward in operation. The program opens with a command line, for instance, which actually works as a simple local shell at your Windows user folder (C:\Users\[UserName]). You can browse your system, manipulate files and run many DOS commands as usual. A tabbed interface means you can have several command line sessions open in the same window, and this could make it worth installing the program all on its own. When you do need to open a new session, a detailed Session Properties helps you configure every aspect of the program: authentication, login scripts, SSH, terminal standards, appearance, logins and more. But when you just need a quick SSH session, type your host name or IP address in the address bar (mysite.com), Xshell will prompt for a logon and get you connected. If you’re currently using some other SSH client, then, you’ll quickly feel at home. And while there are plenty of advanced features here, they don’t get in your way. So you might start by assigning some commonly-used command or string to a button, saving a little typing time. But if you need more, you can try out the program’s new synchronized input redirection feature. Enter commands in one tab, and they’re simultaneously sent to multiple selected tabs, with the results displayed right away. 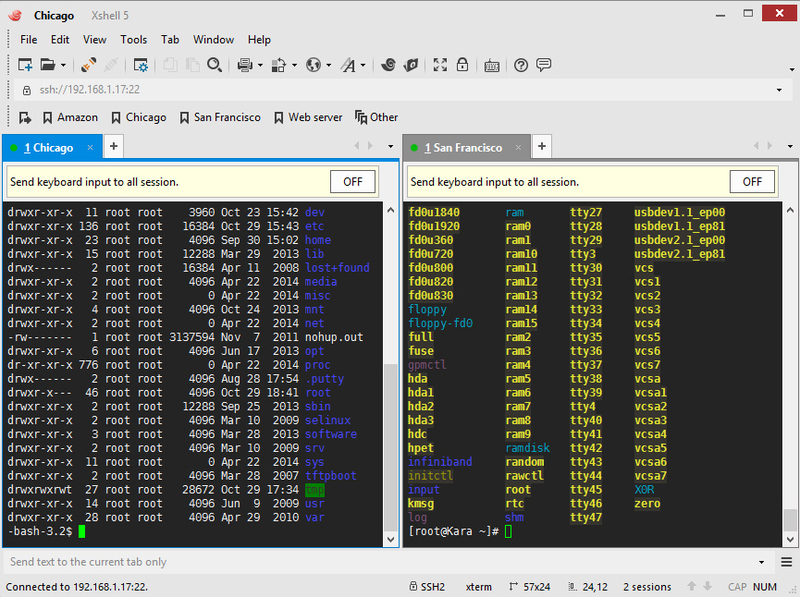 Put it all together and Xshell 5 has something to offer everyone, from SSH novice to expert users. Give it a try.